He’s the Sherlock Holmes of entertainment if Holmes had a flair for comedy, the Great Detective of live events performing everywhere from Off-Broadway, New York, to Caesars Palace in Las Vegas and the Magic Castle in Hollywood, Los Angeles. The forensic mind reader will know what you’ve had for lunch, where you’ve been that day, what you do for a living, the car you drive, even your PIN code. He’ll read you like a book. His Edinburgh Fringe shows sell out annually, recently voted in the top three of over 4000 acts. In 2017, Cloud appeared on the Royal Variety Performance and toured the U.S. in The Illusionists Live from Broadway. 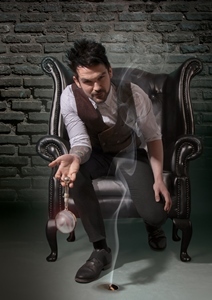 Colin Cloud’s award-winning act leaves audiences astounded, bewildered and mesmerised. His mind-blowing presentation challenges the way we all think about the world and has been described by many as positively life-changing.